Through the winter months, on road trips from Utah to Louisiana and sitting on couches in Oregon with family, I knitted this baby blanket. It’s one of my favorite blankets to date (and I know I keep saying that), but I’m getting better at the knit stitch, and this time the yarn also made a huge difference. I used “Ocean” by Paton Colorwul, which is 100% wool, and I absolutely loved it. Wool yarn is expensive, and it can be scratchy, but when it’s done right, no other yarn compares. As I am wont to do, I ran out of skeins and had to frantically track down the last one from a Michaels across the valley. I’ve been trying to be more careful about buying skeins with matching lot numbers, but when you run out of yarn, you aren’t left with many choices. 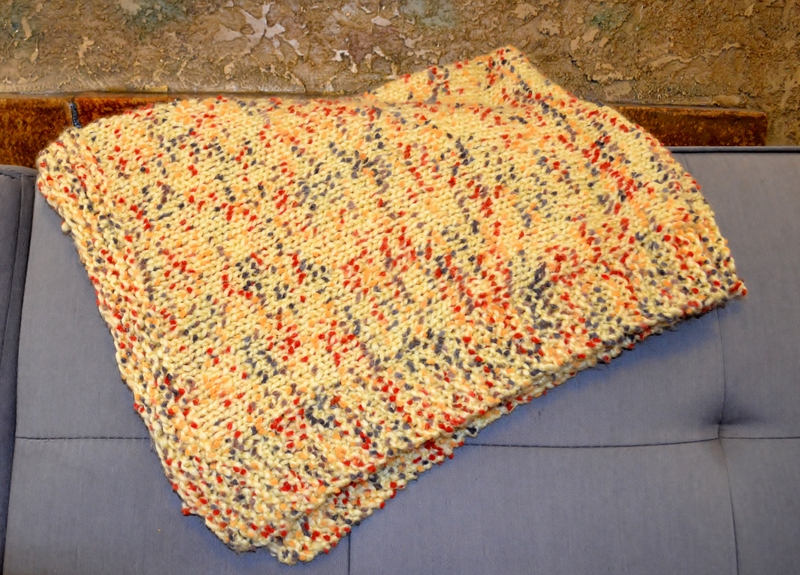 The blanket was finished just in time to serve as a gift to a friend who gave birth to her son last month. I have identified somewhat with her journey to motherhood (i.e., she’s had love, life, travel, education, and a career before she very actively chose motherhood), and so I liked giving her an extra special gift. -Knit purl, knit purl, purl knit, purl knit until the row is finished. -Then reverse it: purl knit, purl knit, knit purl, knit purl until the row is complete. -Continue this pattern until you’ve got a few inches of a ribbed border. -Then, knit the rest of the blanket until the last few inches or so. -Finally, repeat the pattern from the beginning (knit purl, knit purl, purl knit, purl knit; then reverse it on the next row) to create a ribbed border again at the other end. The finished product should be rectangular, with a ribbed border at each end. I’m getting better at making even stitches, and so the wobbly edges of my previous blankets are starting to disappear (though not entirely). My idea for the ribbed border on the ends was actually difficult to keep track of. There is an easier way to do ribbing, but I wanted the ribs on this border to be a little thicker. Normally, I like very absent minded knitting (for which baby blankets are perfect). But, these borders were knitted and torn out a few times before it was all said and done. It still ended up a little uneven in places. The take away: if you’re looking for an easier border, there are easier patterns out there. If you’re looking for the perfect yarn for a baby blanket, look at the Paton Colorwul selection. This entry was posted in knitting, life, love, Uncategorized and tagged baby blanket, baby blanket knitting pattern, crafting, knitting pattern, michaels, paton, paton colorwul, paton colorwul ocean, paton yarns, pattern, skein, stitch, wool on July 26, 2016 by sherewin. This year I made a few headbands and scarves to give away as Christmas gifts. I’ve done this before, but this year there’s a marked improvement in the quality if my stitching. I’m using better yarn (wool and wool blends) and experimenting with different stitches. 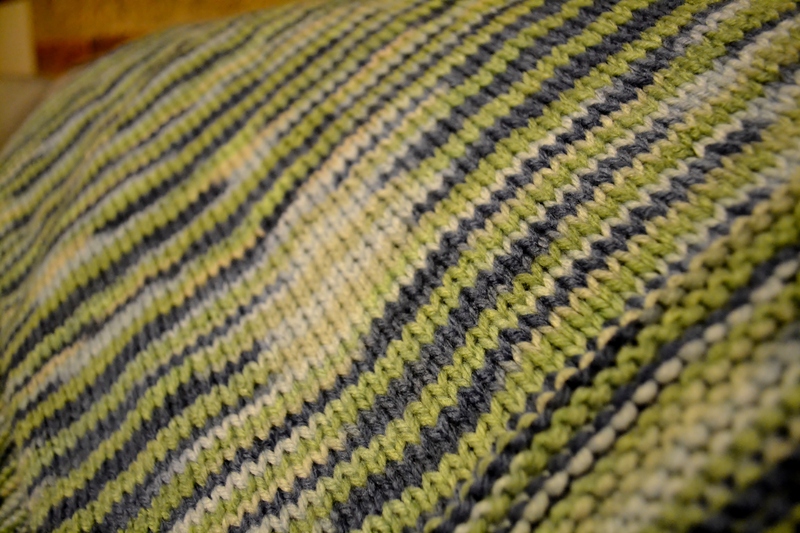 This year, I learned the basket weave stitch, which is featured here. For the basket weave, you cast on the number of stitches that you want. (It has to be a number that is divisible by four.) Then you knit four, purl four, knit four until you’ve reached the end of the row. You turn it over, and you repeat: knit four, purl four until you’ve reached the end of the row. In each new row, you’re actually knitting and purling the opposite of what you stitched in the previous row. Repeat this knit/purl pattern for four rows, and then reverse it. Purl four, then knit four until the end of your row. Continue switching it every four rows until you’ve reached the end to create the basket weave texture. For my first attempt, I made a scarf that had about seven inches of basket weave on both ends and regular knit stitch for the rest of the scarf. I didn’t love the way it turned out. In addition to the ends, I think continuing the basket weave stitch along the sides of the scarf would’ve created more continuity throughout the piece. So, I’ll continue to experiment with that. What I think really turned out well was the scarf done entirely in basket weave. 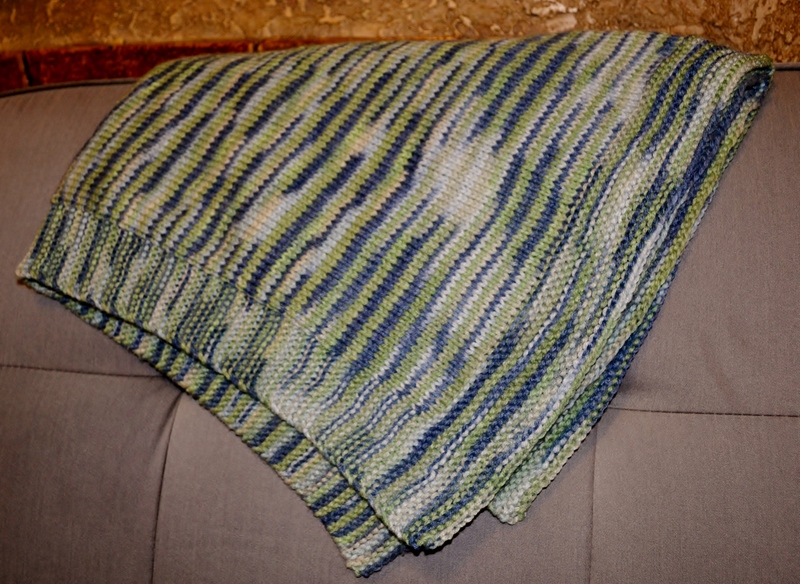 For it, I used Patons Classic Wool worsted in Jade Heather and US 7 (bamboo) knitting needles. I made a headband first, and then used the remainder of the skein on the scarf (which could’ve been longer). For the headband, I cast on 16 stitches, and then proceeded with the basket weave until it fit snugly around my head. Then, I cast off and stitched up the ends of the headband with the loose ends of the yarn and tied it off with a simple knot. For the scarf, I cast on 32 stitches (and this width was absolutely perfect). I then proceeded with the basket weave until casting off at the end of my skein. I’ll definitely continue with the basket weave. Once you get the hang of it, you can do it pretty mindlessly (while watching tv, road tripping, etc. ), and the end result creates a lot of nice texture and depth. This entry was posted in knitting, Uncategorized and tagged arts and crafts, basket weave, dark grey mix, headbands, jade heather, knit stitch, patons classic wool, purl stitch, scarves, stitch, US 7 Needles, worsted, yarn on January 3, 2016 by sherewin. Recently a colleague, who takes crafting above and beyond anything I will ever do, stopped by my office to talk about the stuff we’re making, and I was motivated to put together this post about my last baby blanket. I made it as a gift for my cousin’s daughter. Her son got one when he was born, but I hadn’t made one for the older daughter. My homemade blankets have imperfections (which makes them unique! which isn’t something everyone values! )), so I was delighted when my cousin’s husband mentioned that their son loved his blanket and used it all the time. Here’s the blanket that I made for my cousin’s daughter. I’ll be using this pattern again. I think it is my best baby blanket to date. 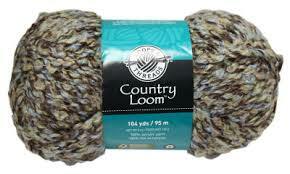 I used four skeins of Loops and Threads: Country Loom – Lavender Blues. To start, cast on 73 stitches and knit five rows. Then, to create the border, knit four (mark) add increase, then knit across for 63 stitches. Add another increase, (mark) and then knit the last four. In the next row, knit four (mark), add increase, and then alternate between decrease/slip, increase/knit stitch all the way across for for 63 stitches. At the end, add increase (mark), and then knit the last four stitches. For the body of the blanket, continue to knit four (to the mark), increase, knit across (for 63), increase, then knit the last four. For the next row, knit four, then decrease, purl across, decrease again, and then knit the last four. Continue to alternate between knitting/increasing rows and purling/decreasing rows. Stitch to the desired length. I ended on knit stitch (with increases on each end before moving on to border). 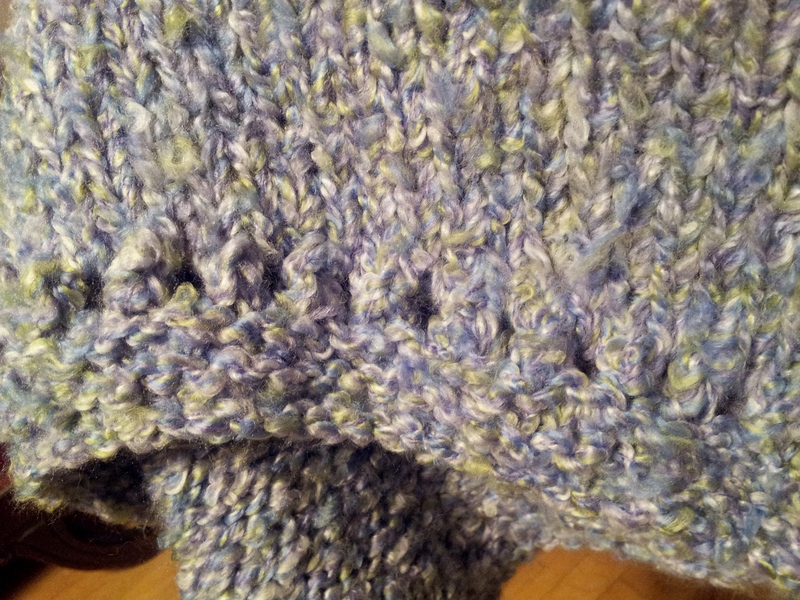 At the very end, knit four, decrease/slip, increase/knit (for 63), then knit the last four stitches. That creates the last border edge. Then, knit the last five rows, and cast off. This entry was posted in art, knitting, work and tagged baby blanket, baby blanket pattern, crafts, knit, knitting, knitting needles, knitting pattern, Lavender Blues, Loops and Threads: Country Loom on June 22, 2015 by sherewin. I have a strong sense of home, which, I think, helps me face the world, move to new cities alone, earn degrees, travel, take (measured) risks, etc. The last few months have been emotionally grueling for me, but I am home now and finally feel like I can really take a deep breath. Suddenly, my priorities come into focus. Here there is gathering eggs, checking the under ripe fruit, sitting in the yard under a shade tree reading a Laura Ingalls Wilder book I found, Ginger, Jackson, and the cat, the mock orange, wild roses and yellow and joseph’s coat homestead roses in bloom, the new kind of yellow bird that’s made a nest in the front yard, pelicans, baby cones at Little Bear (C-zers soon to follow), the Subaru loaded down with bailing twine, everyone going 5 miles per hour under the speed limit, long walks down gravel roads, long conversations that last all morning and then go late into the night, fresh lettuce out of the garden, eating raspberries off the bush, running to Food Town for junk food I wouldn’t normally eat, having real dirt come off my hands when I wash them, kiddie pools, popsicles, sheep grazing in pastures, one late calf bawling for its mother, gardens growing so fast you can almost see it, knitting up skeins and skeins of yarn, planning the next batch of soap with Mom, making raspberry jam, knowing everyone I see, trading stories of new babies, divorces, car wrecks, illness, and wedding engagements, people dusting off their saddles for rodeo, the linear pattern of cut hay, geometric bales, the breeze, the sun, the temperature—everything I know so well. This entry was posted in enlightenment, family, garden, knitting, life, love, reading, travel, Uncategorized on July 6, 2014 by sherewin. These baby blankets have been really fun to make! They provide a good opportunity to practice knitting. It’s a good way to get really comfortable knitting, purling, casting on, casting off, and joining in a new skein of yarn. They’re not very challenging, but they’re fun and satisfying. Also, as a doula, there are a lot of babies. So, baby blankets it is! My most recent endeavor is making a baby blanket for a woman I work with who is having a baby within the month. I really loved the yarn I used. It’s Loops & Threads Morocco in the color “Spiced Chai.” I originally bought four lovely skeins on sale, all from the same lot. As I neared the end of my fourth skein, I realized I would need another one. Unfortunately, two nearby stores had discontinued the yarn, which is weird, because I love the color(s). 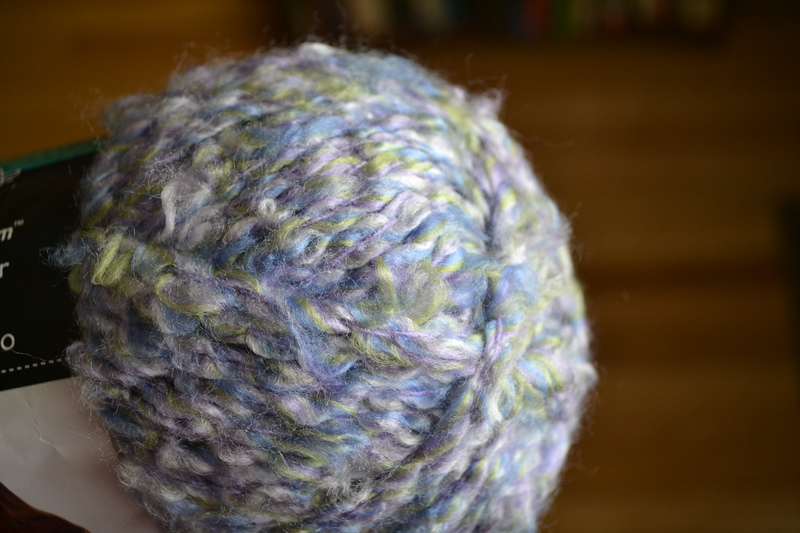 Thankfully, I found a skein out in West Valley, which was, of course, from a different lot. Oh well. 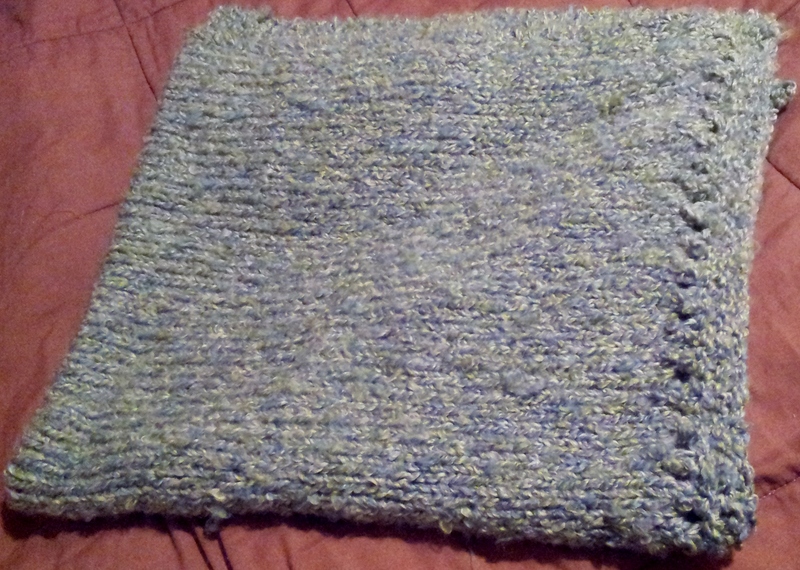 For some reason, this blanket turned out a lot more uneven than the last two. The end that was cast off was really pinched and tighter than the other end where it was cast on. I also dropped two stitches (oops! ), and cobbled it back together, but I ended up with two holes, the largest being a little less than a centimeter in diameter. Not very noticeable, given the loose stitches I was using, but definitely something you can see if you’re looking. 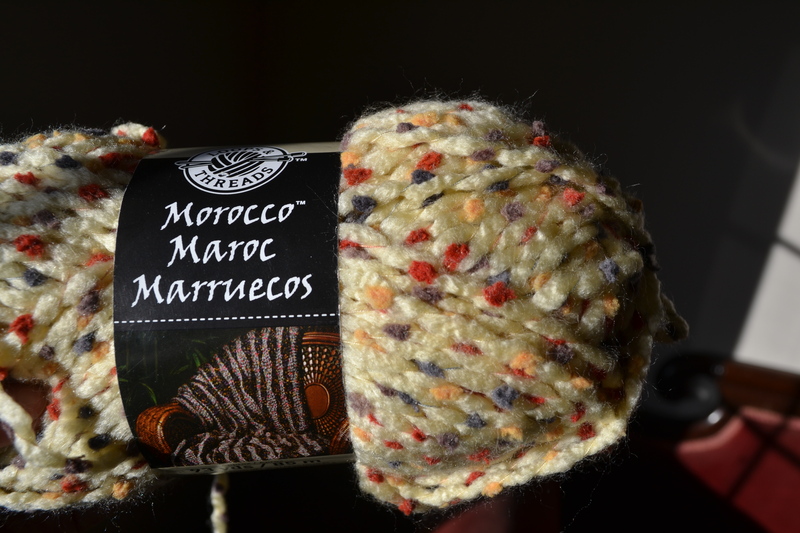 I used five skeins of Loops & Threads Morocco in the color “Spiced Chai.” I used size US 13 knitting needles on the round. The needles were too big for this yarn, which might be why the blanket turned out lopsided. I liked the loose look of the knit, but in hindsight, it probably would’ve been better to knit it on US 11 needles. I can’t remember what size of needles the yarn called for. Cast on about 75 stitches. Stitch for 9 rows. Last time, I only stitched 7 rows and the border on the ends was thinner than the border on the sides, so I tried to make the ends a little bigger by adding two more rows. In hindsight, I probably should have add even more rows because the borders on the ends, were still a bit thinner than the sides. Row 10: I knit seven stitches, marked it (with a twisty tie! ), then purl stitched 61 stitches, marked it, then knit stitched the last seven stitches. Row 11: I knit stitched seven stitches, marked it, then knit stitched 61 stitches, marked it again, and then knit stitched seven stitches. Row 12-? : I continued to knit a regular stitch for the first and last seven stitches of each row, and then I alternated knitting and purling each row until I had almost finished five skeins of yarn. 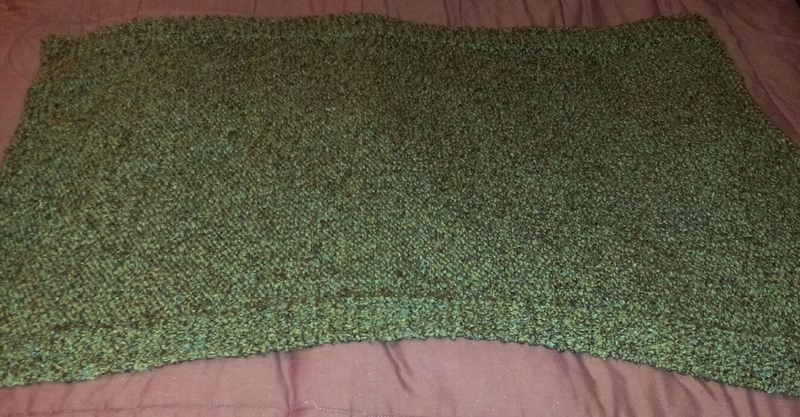 The end result was about 32 inches wide and 45 inches long. The baby blanket with border with Loops & Threads Morocco in Spiced Chai. 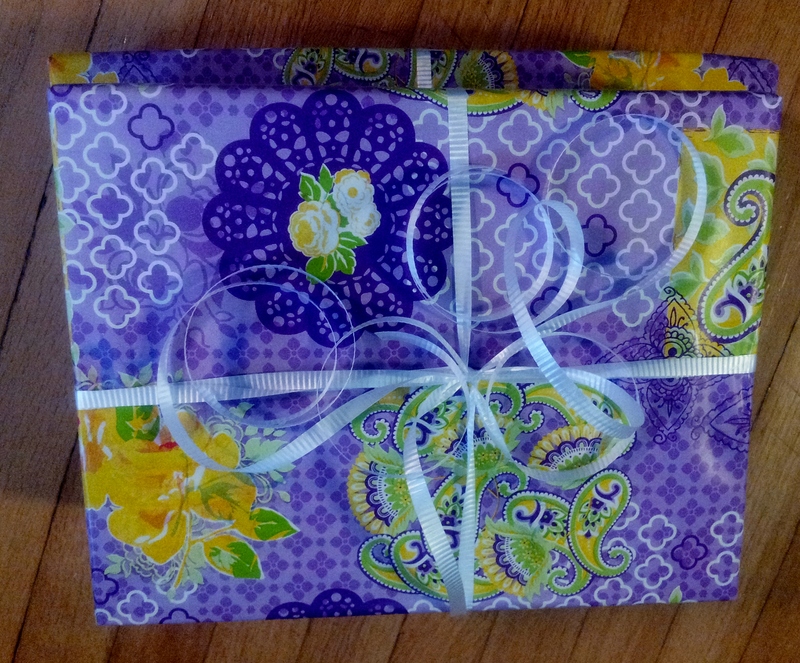 And another one, just because I love this wrapping paper! Here it is. All wrapped up. 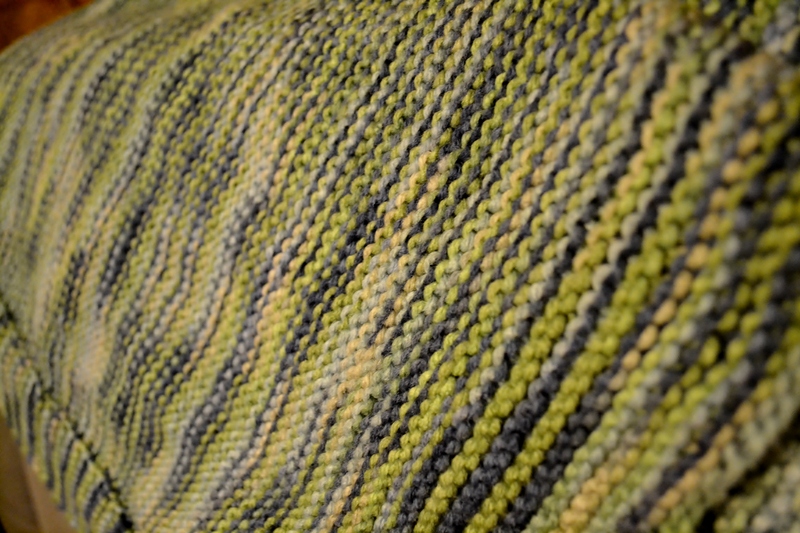 Fyi, a previous baby blanket knitting entry can be found here. This entry was posted in doula, knitting, work and tagged baby blanket, Loops & Threads Morocco in Spiced Chai on March 7, 2014 by sherewin.